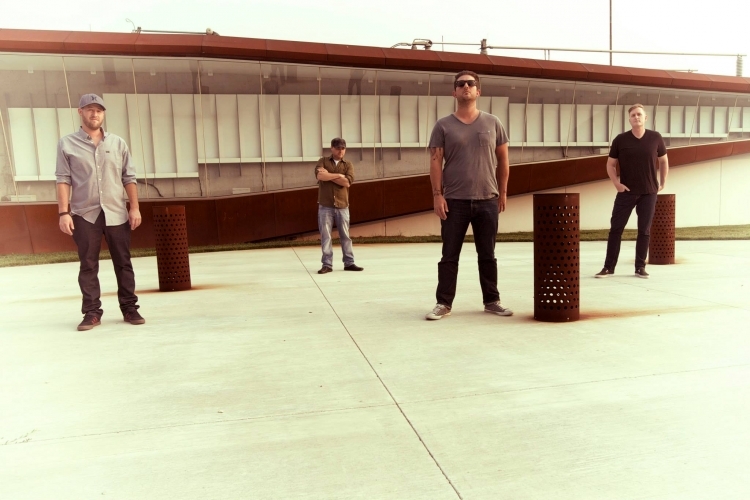 We want to again congratulate The Deli Readers’ Choice for 2014 KC Emerging Artist, Kangaroo Knife Fight! Having only played out since July, the band has busted through the KC music scene with its soulful rock tenacity and its debut self-titled album, released in December (here’s our review of it). Here’s your chance to find out more about the guys and their music. Kangaroo Knife Fight: It’s a combination of four different worlds—just like the ninja turtles—where Anthony is Michelangelo, cause everyone wants to be Mikey; Gus is Leonardo because he’s our fearless leader; Brandon is Donatello because he’s funny and knows the technical side of music and Ian is Raphael, the warrior-like drum abuser. The Deli: Give me a little background info on Kangaroo Knife Fight. How did it come to be? KKF: Ian, Gus, and Brandon came out of Little Rosco looking for a new voice. Anthony was living in Australia looking for a band and we were in Kansas City looking for a singer. Gus listened to Anthony’s Youtube videos and heard potential so he contacted him via email. They set up a phone call, exchanged music and came to a consensus that we should at least give it a try. The band agreed to start working on music and Anthony would let us know when he got here. It took about 5 months for Anthony to arrive. Gus and Anthony worked up a 40-song acoustic set and started playing acoustic shows pretty much immediately at The Phoenix, Gordon Biersch, The Red Door Wine Store, and house parties in January 2014. During that time, the band reworked its sound a few times from ‘70s-style rock to pop and ended up where we are. The first show was July 17, 2014. It was a great first show and confirmed the hard decisions we made about what direction to go musically. Even before our first show we had started recording our EP at our practice space and released it officially on December 6, 2014. KKF: The four of us in a room is all we really need. At its base, our music reflects our lives in some way. Songs often start with humming a melody, a guitar riff, a bad day, or just reflecting on life in general. The first draft of a song typically comes together quickly. The final draft can take months. One of three things has to be present though. The song either has to make us move, feel something, or rock hard. The best songs have all three elements. KKF: The biggest accomplishment of all is having people respond to all the hard work we put into our songs and supporting us. We’ve all been in bands that didn’t connect with people. That is difficult and discouraging. The trick with music is being able to connect, unless you are using it solely for personal therapy. The Deli: Where’d the name come from? KKF: Anthony wasn’t even here yet. Names are so freaking hard. Everything is taken. Now you see people spelling things different, stringing words together, etc. Ian, Brandon, and Gus were brainstorming on the impossible task and tried to figure out a way to work in the Australian aspect. Brandon blurted out “Kangaroo Knife Fight.” Ian and Gus laughed and said, “That’s it.” Brandon said, “No way, I was just joking.” But we flattered him into keeping it. From Anthony’s perspective, we are just exploiting him for his Australian roots. Whatever. The Deli: Tell us about your self-titled debut album. What can we expect from it? KKF: Wow. This was a rollercoaster. We started recording this in Gus’s basement soon after Anthony arrived. We tracked 7 or 8 songs and when we tracked “It’s You,” we knew we had a song to build an EP around. Then we focused on the 4 most developed songs and got the basics down. Gus had met a mix engineer named Noah Shain who worked with Skrillex and Dead Sara. Being a huge fan of Dead Sara’s last record, Gus asked Noah if he would consider mixing the record. He said yes, but we had a deadline before Dead Sara was coming back in for their new record. We had to rush a bit and there were compromises, but the EP turned out as good as we could have expected. It is in a lot of licensing libraries, so our fingers are crossed that one of the songs will grow wings. Who knows? KKF: Well, it’s like supporting your home team. You need a supporting foundation in order to move forward successfully. You do this by building a solid base at home with the ones closest to you. We will say, there are a couple paradigmatic figures in this town and we all know who they are. Some work in front of the scene, some behind it, some both. As a band, we feel an obligation to spread the word about events and share the information coming from the people that keep this machine turning; behave properly with other bands, promoters, sound people, talent purchasers, bar owners, etc; and volunteer personal and band time and efforts to increase the status of music in Kansas City and beyond. We always wish we could be doing more, but none of us are only musicians and that’s just the way it is. KKF: We all have different favorites on both levels. Without naming who likes what, local bands that we really appreciate that are currently very active are Atlas, The Blackbird Revue, Not a Planet, The Philistines, The Architects, Six Percent, AY MusiK, Tech N9Ne, Hembree, Admiral of the Red, Westerners, Outsides, My Brothers and Sisters, Drew Black & Dirty Electric, Federation of Horsepower, We Are Voices . . . I think we could go on for quite a while. KKF: We are into Royal Blood, Sam Cooke, Goldsboro, Dead Sara, Florence and the Machine, Queens of the Stone Age, Arctic Monkeys, Foo Fighters, Glasvegas, Wolf Alice, The Crash Kings, Elbow, Prince. Again, we could go on. KKF: We’ll let Anthony answer this one: Sam Cooke, Powder Finger, Led Zeppelin, and Kangaroo Knife Fight at Red Rocks on a summer night in the afterlife. KKF: This is a hard one. We’ll follow Anthony and say Mozart, Bob Dylan, Aretha Franklin, and Sam Cooke. Mozart because he is the founding father of exceptional melodies. Bob Dylan for his poetry and lyrical magic. Aretha Franklin because she is one of the greatest female vocalist of all time. Sam Cooke because he brought the smoothness that’s found in soul music today. The Deli: What goals does Kangaroo Knife Fight have for 2015 and beyond? KKF: We are really having a hard time keeping up with promotions, band development, gigs, and writing new stuff. There is so much that we need to do and want to do. At the moment, it’s just full speed ahead, but it’s not as organized as it should be. We need some freaking help! Volunteers? We just uploaded a new video that we are putting out right about now. After April, we suspect we will start demoing new songs for a new release in 2015. If we are able to secure the funds, we might actually work with a producer on this next record instead of doing it on our own. I suppose we need to figure out if we have a fan base willing to support a Kickstarter campaign. We are so new that it’s hard to tell if we could pull that off. KKF: For bands? Integrity. Keep it. Without it, you’re going nowhere. Don’t BS other bands, promoters, venues, etc. Just be honest and do what you said you would do. You will get more respect and your band will go further. This Saturday, Kangaroo Knife Fight will be playing the third MidCoast Takeover fundraiser at recordBar with The Big Iron, Appropriate Grammar (reunion show), and Reid the Martian. Facebook event page.